Cha-cafe wa takes its vegetables very seriously – they want to offer you food that is gentle to your body and they also have Chinese medicine-inspired teas for you to drink. The food here is made by using generous amounts of homegrown organic seasonal vegetables. The reason why they take such great attention to their ingredients is that they believe that the best way to keep yourself healthy is by eating seasonal vegetables when they’re at their most delicious state. The restauranteur told me “Seasonal vegetables taste the way vegetables should taste, and by eating them you get more energy.” Their tea is inspired by Chinese medicine, or to be more exact, the Japanese take on Chinese medicine, known as kanpo. They have 10 different kinds of medicinal teas with different flavors and health benefits. You can choose the tea to fit your current mood and the state of your body. At Cha-cafe wa, they use no readymade curry sauces to make their Yakuzen curry and instead make it from scratch using their secret recipe. The spice mix used to make this curry contains not only coriander powder, cumin, turmeric, and other spices, but also Chinese cinnamon, goji berries, and other ingredients normally used in Chinese medicine. The curry at Cha-cafe wa has a strong, appetite-increasing spicy fragrance. The chicken in the curry is chopped into big pieces, so it goes very well with the spiciness of the curry. When eating this curry, you’ll start feeling warm from the inside, and this warm feeling will continue even after you’ve finished eating. This cup of tea is made with green tea as its base, and then eight different medicinal herbs are added to it, making this cup of tea not only delicious to drink but also pretty to look at. The tea is served in a teacup with a lid. This is so that you can drink the tea without getting all the medicinal herbs in your mouth; the correct way is to drink the tea with the lid on and open the lid a little bit. The taste and smell are both sweet, and this tea is easy to drink. You can re-steep the tea twice and enjoy the change in taste this brings. This tea helps balance your body. The seasonal pasta at Cha-cafe wa is made with fresh vegetables from Cha-cafe wa’s own fields. The vegetables are different every season, so the type of pasta served also differs based on the season. The pasta is made with the seasons most delicious vegetables, so you can enjoy the real taste of them, and the strong umami in these seasonal vegetables. How about recharging your batteries with some organic, strong vegetables? You also get French bread with the seasonal pasta so there’s quite a lot to eat. This deluxe dessert plate contains cheesecake, chiffon cake, pudding, chocolate cake, and ice cream. All the desserts are homemade with carefully chosen ingredients. The cheesecake tastes so rich you almost feel as if you were eating cheese. The chiffon cake is so light and airy you’re sure to be amazed. When eating it, you also get to enjoy the fragrant herbs used in making it. The pudding tastes mellow and has a gentle sweetness to it. The staff told me some people even come to this restaurant just to taste their pudding. The chocolate cake is gluten-free, made only with 72% cacao, butter, and eggs. The moist cake has a rich, complex, chocolaty taste. The ice cream is different from anything else I’ve eaten; it’s made in-house at Cha-cafe wa! The taste is simple yet the egg in it brings complexity to it. The menu has pictures on it, so you can order by looking at them. They have an English menu with explanations of the medicinal teas on it, so you can choose the tea that goes the best with your current state. They have some very reasonably priced set menus available too. You can choose “Tea of eight treasures” as the drink for +100 yen. The restaurant had a very Japanese feel to it, and all the dishes and desserts I enjoyed here were delicious. I could feel myself getting more energy as I ate seasonal, living vegetables, and drank medicinal tea. I noticed how important what you eat is for your overall health. It made me think of what I’m going to eat from now on. The food here is inspired by Kanpo, traditional Chinese medicine as interpreted by the Japanese. But although the food here is medicine inspired, the taste is not bitter or anything the taste of the food here is quite strong and rich, nothing like you'd expect medicine to taste like. Cha-cafe wa is most famous for their curry, and I have to agree with this general consensus: their curry is incredibly good. However, the most unexpected thing about this cafe was how good their cheesecake was – it’s really the perfect ending for dinner here. A 3-minute walk from Kami-Horikawa bus stop. Irregular holidays (check their Facebook page). They have their menu partially in English. 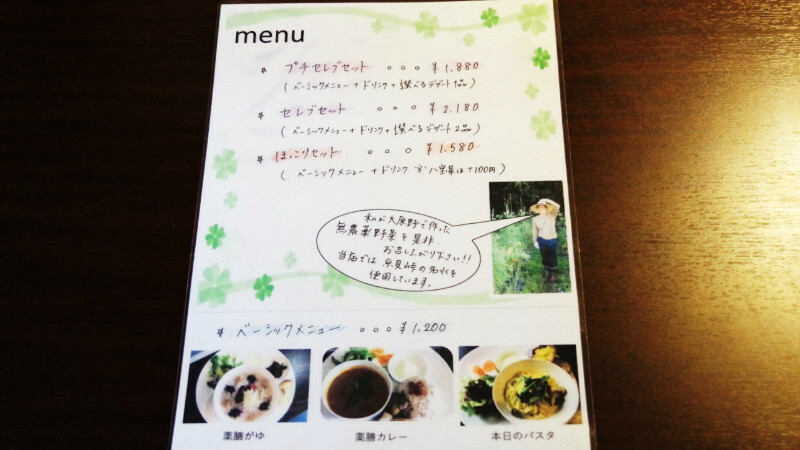 However their Japanese menu has pictures on it, so you can choose by looking at them too.